Thus began my love for this long running, British sci-fi series. Back in the late 80’s, the FX weren’t any worse than the classic Star Trek being shown in syndication. 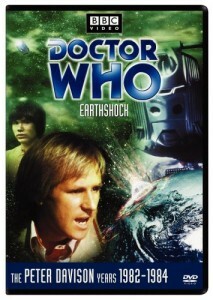 And Earthshock is a very powerful episode to introduce one to the goodness of Doctor Who. A squad of military troopers there to rescue some scientists who’d been trapped underground, but there’s only one survivor. 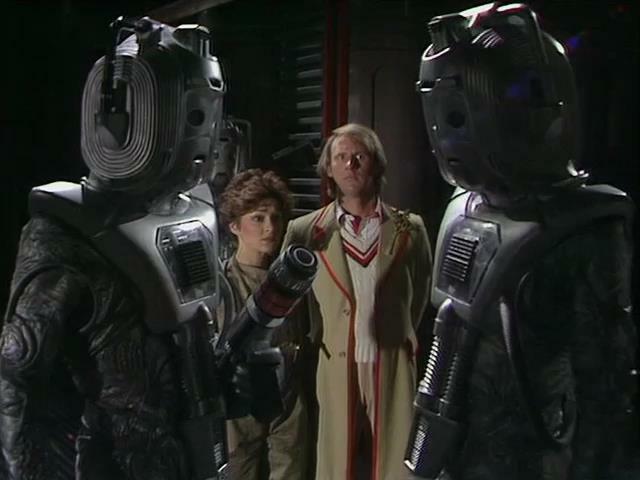 The squad heads down to investigate, where they encounter the Doctor and some of his companions, accusing them of causing the problems. An attack by two androids soon proves the Doctor’s innocence, but after destroying an android and forcing the other to retreat, the Doctor discovers what they were protecting — a massive bomb, being sent signals from somewhere in space. 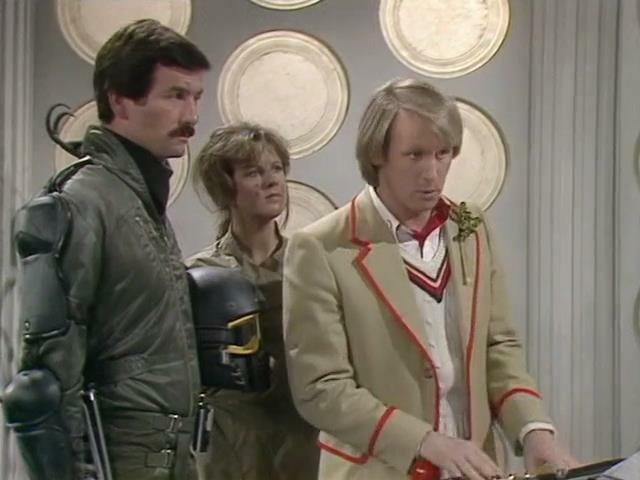 After disarming the bomb, the Doctor reluctantly agrees to allow the surviving troopers and lone scientist to accompany him as he tracks the signal to a freighter bound for Earth. After materializing the TARDIS in the ship’s cargo hold, the Doctor and Adric set out to get noticed. Unfortunately, they come upon two dead security officers and are accused of murder. 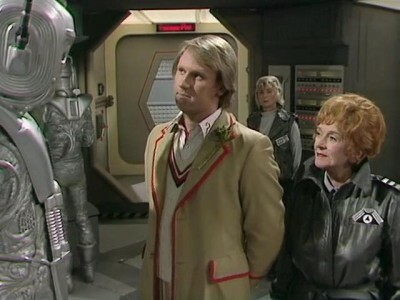 Despite the bullheaded ship’s captain not wanting to stop for anything, the real culprits are revealed — the Cybermen, who quickly overcome the ship’s security force and take over the ship. Despite having been thwarted when the Doctor deactivated their bomb, the Cybermen are moving forward with plan B, whereby the freighter crashes into Earth, killing delegates at a conference being held to address the Cybermen problem. 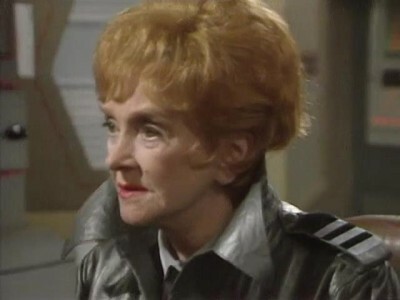 With a cyber device in control of the freighter, Cyber Leader decides to have the Doctor take them to safety on the Tardis while the cyber forces activate and leave. Adric is left behind with the survivors of the ship’s crew, and he manages to overcome two of the three lockouts of the cyber device. This causes the freighter to shift back in time, causing Cyber Leader to force the Doctor to have the Tardis follow. Lt. Scott and his few remaining troopers overcome the Cybermen guards to rescue Adric and the crew so they can escape. 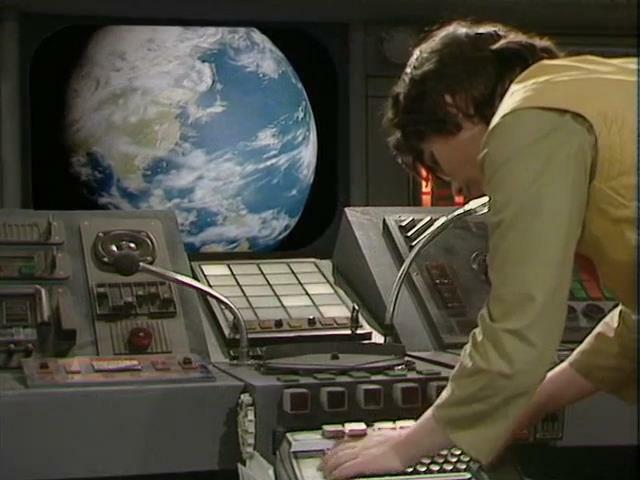 Adric, who was frustrated over not cracking the third lock of the cyber device, suddenly has a solution and returns to the bridge alone. 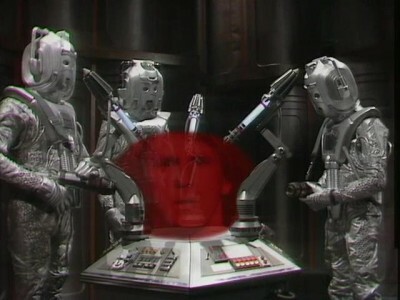 However, his efforts are thwarted when a damaged Cyberman blasts the navigation console. The freighter is now 65 million years in the past when it crashes and explodes on Earth, revealed to be the cause of the extinction of the dinosaurs. The nice thing about viewing Earthshock on PBS back in the day is that all four parts of the episode were shown back-to-back. Thus, I didn’t have to wait week after week to see what would happen. Awesome. As an entry point into the Doctor Who franchise back in the late 80’s, this was an excellent one to do so. For starters, we have a classic Doctor Who foe in the Cybermen. Further to that, this episode has a montage to previous Doctors when the Cyber Leader briefs his lieutenant on what they are up against. Further, there were numerous reference to earlier episodes which gave the a glimpse of how huge this universe of Doctor Who truly is, but also piqued my curiosity to know about E-Space, Romana, and the like. As I think back, I realize this was likely the point to where I began to prefer serial TV series rather than episodic TV series. The story is quite dark, much more than I had expected as a teenager, but I think that darkness is partially what has made it still such an enjoyable episode for me to this day. You have the scientific team having been wiped out with a lone survivor. You have a military squad sent underground to try to find out what happened and who was responsible. You have something stalking the team and killing some of its members in gruesome ways. Of course, the ending of the episode makes this one of the darkest (if not the darkest) Doctor Who episode ever made. More on that in a bit. Part 1 sets up this false notion that the antagonist of this episode will be a couple of mysterious androids. 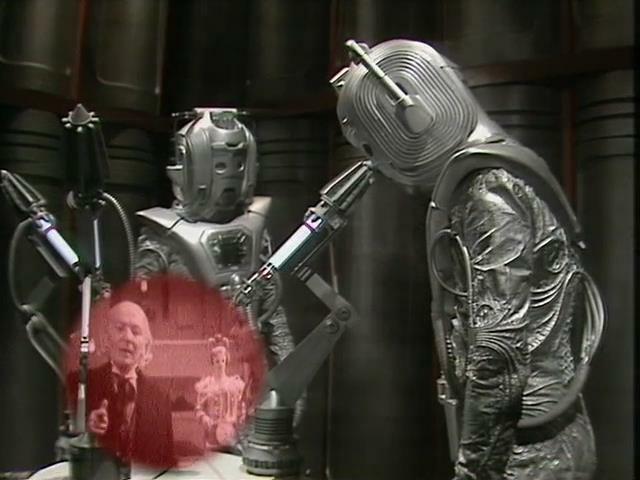 So at the end of part 1 when it is revealed that the Cybermen are actually pulling the strings from a safe distance away from Earth, it is a nice surprise. Part 2 has the nice montage of the previous Doctors, but other than having to deactivate the bomb and get to the freighter, not a whole lot goes on here. 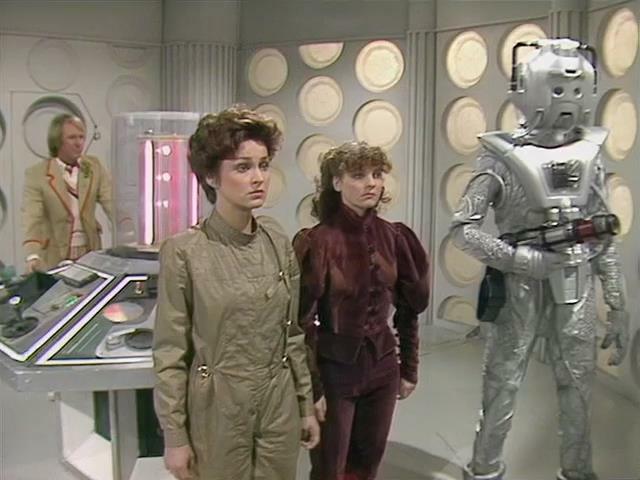 Part 3 picks things up when the Cybermen reveal themselves to the Doctor and company and there’s a desperate fight to try to prevent them from taking over the ship. 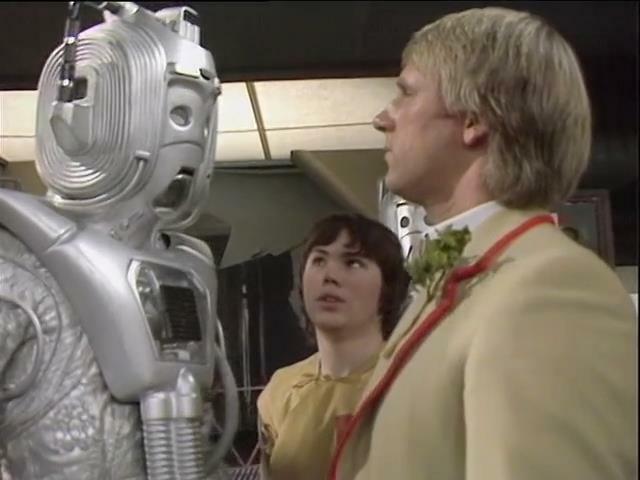 Part 4 then wraps things up nicely by having the Cybermen succeeding everywhere, only to have their plans thwarted by the freighter suddenly entering a time warp thanks to Adric’s intervention. I liked this idea that the object that struck Earth and killed off the dinosaurs over 65 million years ago was in fact a freighter from the future, which had been turned into a flying bomb to try to destroy Earth of the future. The Cyber Leader was pleased when he heard that the freighter was traveling back in time because he’d be destroying Earth at an earlier point in its history, thus changing time, thus removing humans from thwarting Cybermen plans and making the Cybermen a more powerful force. When Cyber Leader learns that all that’s going to happen is make sure history happens as it should, it was as if I could actually see the face of the Cyber Leader fall, a tribute to the acting skills of David Banks, who is the best Cyberman ever, even over the new Cybermen. 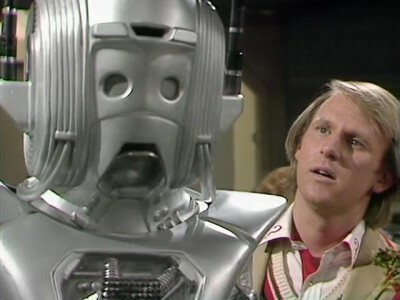 Yeah, I know Cybermen aren’t supposed to have emotions, but there’s just something about the way David played the role that I just loved and miss today. 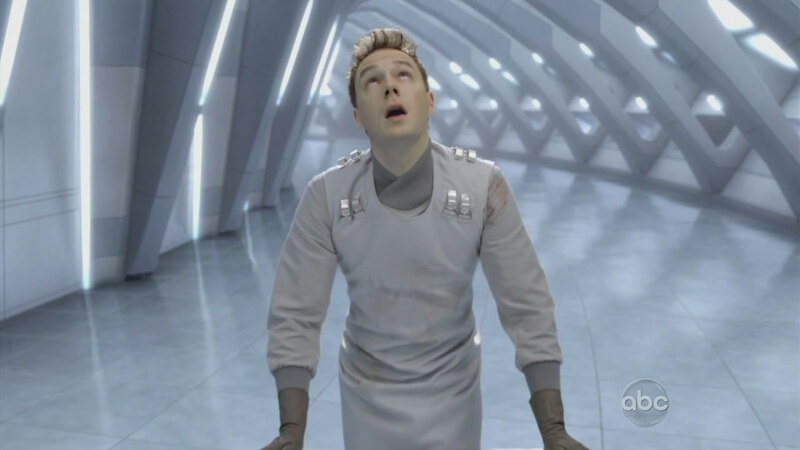 Then there’s Adric. 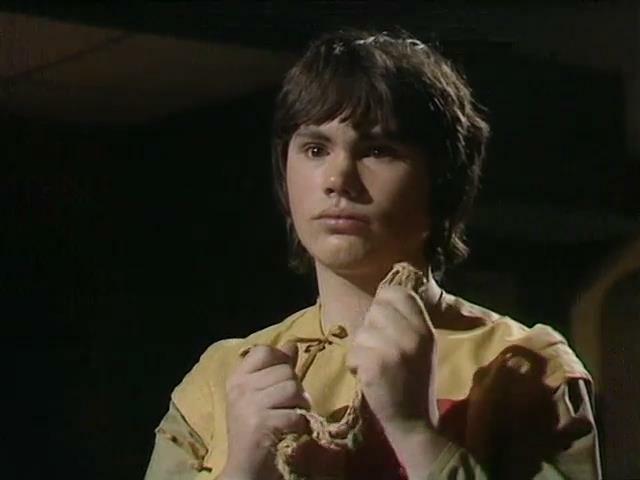 Although this was the first episode I’d watched for Doctor Who, it was obvious that Adric had been with the Doctor for quite some time. He wasn’t some unnamed, “red shirt” dude waiting to be killed. As such, there was no way I thought he was going to die. As I watched the episode, I thought, “What sort of last second thing will happen to save him? 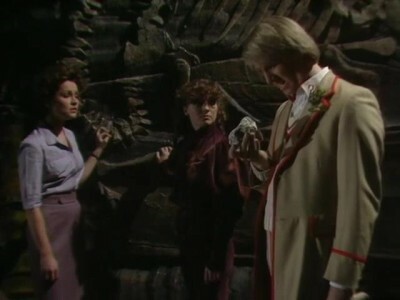 The Doctor does have a time machine, so maybe that’s what will happen.” So I was in a state of disbelief when the freighter blew up, the Doctor, Nyssa, and Tegan were acting as if they’d witnessed a horrific tragedy, and then the episode ends with no music and Adric’s broken badge against a black background. That really had an impact on how I viewed Doctor Who. 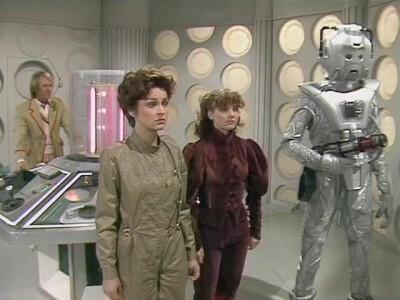 Without a massive history of “The Doctor and his companions always come through OK,” every episode I watched afterward that took place after Earthshock had me wonder if the companion would be killed when their life became in danger. It was a brilliant move. The other weak element was with the Cybermen and their activations. As I understood it, this freighter’s cargo was a legion (or however many) of Cybermen in their tubes. Yet even as the freighter is going on its way to a fiery death, Cyber Leader orders the activations to continue and Cybermen bust out of their containers. I remember thinking that once the ship had been taken over, all of the Cybermen should have been activated immediately, then evacuated. As it was, it seemed silly that Cybermen are being activated at the literal last moment. I loved the joke made about the caverns in part 1 being lit when there were no lights around. It is one of those things that stuck with me from that day forward. After all, when one goes underground, there’s no light, but obviously since the audience needs to see the characters, these caves are always mysteriously lit. Well, this episode gives an answer to how pitch black caves are lit up and a laugh to boot (at least for me). For the DVD, there are some nice things here. 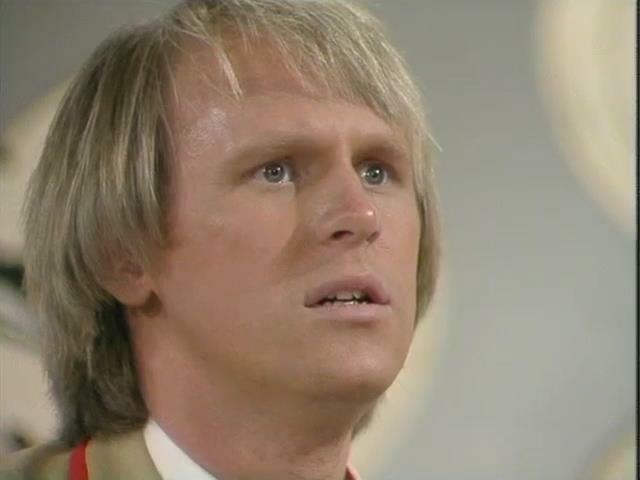 The entire 4-part episode has commentary by Peter Davison (The Doctor), Janet Fielding (Tegan), Sarah Sutton (Nyssa), and Matthew Waterhouse (Adric). There’s an information text option that has popup text blurbs to note trivia things or other things of interest, which I really liked. The featurette Putting the Shock Into Earthshock gives some great info on what went into making this episode, why Adric was forced to leave, and the like. There’s a humorous but short Claymation “episode 5” that suggests Adric actually survived the crash into Earth, only to meet his end by another means. There are other extras as well, but these were the best of the lot. This entry was posted in review and tagged Doctor Who on October 27, 2013 by AstroNerdBoy. As I have mentioned before, I never saw the original V mini-series or TV series beyond a few episodes. As such, I have no ties to the original series and am approaching these first four episodes basically as a newbie to the franchise. While V is clearly a science fiction series, the sci-fi elements aren’t as prominent as a series like Star Trek: The Next Generation, Babylon 5, or even the recent reimaged classic Battlestar Galactica. Obviously, this is partially due to the fact that the series is based on modern day Earth, but the production team has made it so that even when we are shown the Visitor’s ships from the inside, they don’t feel ultra sci-fi. There’s enough of an advanced technology aspect with the holographic displays to remind the audience of the sci-fi element, but it isn’t so in the face of the audience as to put off those who might not really be into science fiction. Well, I say that but what explains the massive drop in ratings for the series? That’s something I can’t explain. I can only say what I like. I’ve heard some complaints about the series being too dull. I haven’t experienced that. I have not found the series to be boring either as the hour seems to just fly by despite the commercial breaks. For me, I like the idea of how the Visitors are keen on invading Earth through non-military means. Part of that is by using the press to their advantage. This is something we’ve seen for years when it comes to our own governments in the U.S. For example, President Bush and his policies were not liked much by the press nor Big Entertainment. As such, any good news is played down and anything to suggest something negative or a scandal is played up. Comedians and political pundits often spoke of how dumb President Bush was, even though his grades at Harvard were higher than Senator Kerry’s, the latter who is seen as an intellectual giant. Transversely, President Obama and his policies are liked by the main stream press, the comedians, Big Entertainment, and many of the political pundits. As such, despite the fact that President Obama has great difficulty speaking without a teleprompter and that he has said things that would have had President Bush ridiculed to scorn, President Obama is given a pass. Anyone raising questions about his policies are discredited. After all, when comparing the two presidents, the template for President Bush was that he’s an evil neo-con who hates poor people and wants to rob from them to give to the rich. The template for President Obama is that he cares for the downtrodden and wants to set to atone for the sins of the past by taking from the haves and giving to the have-nots (and ignoring that the disadvantaged only get pennies on every dollar taken from those who have). Thus we have the Visitor strategy. After infiltrating the planet years ago to help pave the way for the first Visitor ships to arrive (the Visitors are a very patient race and apparently use incrementalism to slowly pave the way for their ultimate goal so that by the time that goal is revealed, it is too late to do anything about it), the Visitors now get the media on their side. Now, the Visitor message can get out without being questioned. After all, the public message is that the Visitors only want the best for humans. However, we the audience know that in reality, the Visitors have much more sinister goals. With only four episodes, what those goals are remains a mystery to me. Clearly, the Visitors are invading Earth and attempting to do so without open warfare (which will cost them lots of lives and may damage whatever it is about Earth that they are keen to obtain). The best way to take over is to do so through political means under the guise of wanting to help the people. As I said, this method keeps the people’s eyes closed until it is too late. Considering the huge armada waiting to come to Earth, the Visitors will need the keep the people passive until the very end. As to characters, I like the cast pretty much. I do find the single mom (Erica Evans) raising a rebellious son to be “meh.” When I think about it, I suppose this may be what folks are keying in on as being formulaic because I think this type of character is cliched a bit. Erica is a tough FBI babe but she can’t get her own son to obey and she’s too keen on being his friend rather than his mother (as I see it at least). Don’t get me wrong, I don’t dislike the Erica character but as I think of it, the character is not really anything special. The Catholic priest Father Jack Landry is a character I don’t dislike either, but he too is a bit “meh.” I say this because he doesn’t seem like a man nor a leader of a congregation. Instead, he seems like a metrosexual type character who happens to be a priest and can’t do anything. It makes the idea that he was in the army seem weak and his clocking a Visitor in episode four really hasn’t changed my opinion of the character being wishy-washy. I do hope that in future episodes, the religious aspects of aliens on Earth can be further explored, though considering how that element has already been dropped, I’m not hopeful. On the other hand, the Visitor rebel Ryan Nichols is probably my favorite character of the heroes. He’s tough but kind, smart but willing to take the risks, and I hope we learn more about him and why he rebelled in the first place. Strangely though, I can’t find much to say about him though I do wonder how he impregnated a human. Also, since the Visitors were the ones to reveal to his girlfriend that she is pregnant, it seems to me that they have to know she is carrying a hybrid child. The supporting character Georgie is another character the writers haven’t done justice too. In the fourth episode, Georgie basically decides that he needs to skin a Visitor to reveal them to the public. Considering how Georgie had lost his entire family to the Visitors and had seen his efforts at rebellion crushed before, why hadn’t he attempted to skin a Visitor before? That’s what I kept thinking when Georgie made it clear what he wanted to do and it came again to my mind when Georgie shot the Visitor professor that they wanted to interrogate. I guess it seemed to me that if Georgie was going to in essence lose it, he would have done so earlier. Still, I’d like to learn more about this character. I do like the character of Anna. The face of evil wearing a pleasing appearance as an angel of light works perfectly for me. Despite some issues with some of the characters, I really have enjoyed the first four episodes of V. I’m not sure why the ratings have dropped so sharply (I’m curious to see the ratings for the fourth episode) and I’d love to hear some analysis on the subject. I’m also wondering about ABC’s strategy regarding the series. To only play four episodes followed by a lengthy hiatus where the series won’t air again until March (assuming ABC doesn’t cancel it) makes no real sense to me. I suppose ABC decided to hedge their bets and see how the ratings were for four episodes before deciding to commit to more to be played next spring. However, having that much time off from a series leads to one thing — out of sight, out of mind. Thus, you have a major cooling off and as people move on to other things, there’s a very good chance that many people won’t bother to return as they don’t have that much invested in the series. Here’s hoping that ABC picks up the series. This entry was posted in review and tagged V (2009) on November 25, 2009 by AstroNerdBoy. V (2009) – 01 "Pilot"
Since my teen years were mostly spent without a TV in our home, I only watched a very few episodes of the original V TV series in 1984 (and none of the 1983 mini-series). As such, I have no attachment to that series. I watched the 8-minute preview of this new series online and found myself intrigued, though I found things to be only eye-grabbing and not much more. However, when I begin to read about how these alien visitors were preaching a message of peace, hope, and change while still being the series’ villain, I had to watch. I’m glad I did. The arrival of the V spaceships was so much like the arrival of the aliens from the movie Independence Day that I thought, “the writers better have thrown in a joke reference about that.” Fortunately, they did just that and more with the mention that Independence Day took the idea from other places (like the original V). Still, their arrival seen in HD looked fantastic, as did the crash of the fighter jet after it lost all power due to the alien ship. 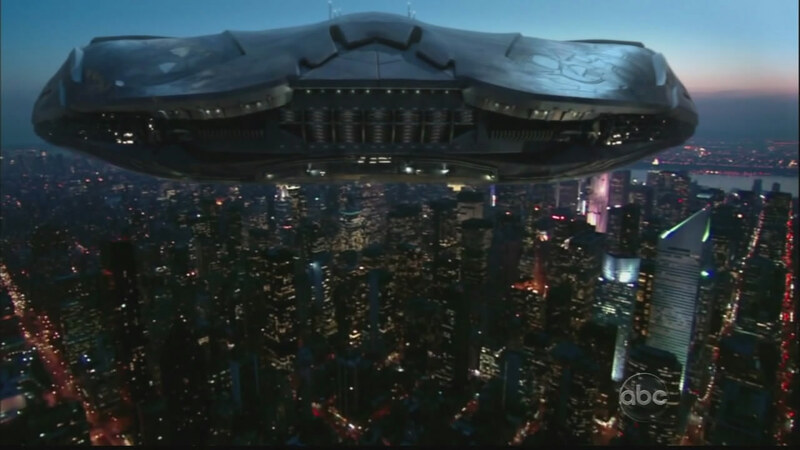 FX-wise, things just really look awesome when it comes to the alien mother ships, shuttles, and the like. Fortunately, this isn’t a show about FX. Like the Battlestar Galactica remake, this new V reimage is about characters and ideals. The Visitors are here to invade Earth plain and simple. However, rather than do like the aliens did in Independence Day (where the aliens began a systematic destruction of Earth’s major cities and military installations) or in the original anime Space Battleship Yamato (where the aliens began bombarding Earth with irradiated asteroids in order to terraform it to their needs), the Visitors have decided to take over without firing a single shot by winning over the hearts and minds of the people. I understand the parallels people have made between the Visitors and the Obama administration. President Obama was seen by many as someone who wants to destroy the U.S. as we know it and rebuild it into something else, being surrounded his whole life by communist fascist who’ve stated this as their goal. A year after his election, more and more people are starting to see his plans as not good for the country and more like an attempt to take over control over all aspects of life, including speech (such as this blog). However, President Obama looked young, fresh, and his message was hope and change, which got him elected. Who does not want peace? Who does not want hope? When things are going negatively, who does not want change (assuming of course it is change for the better and not change for the worse)? Who does not want attractive, smart-looking and sounding people taking charge, especially when they offer nothing but compassion for their fellow man? Many people looked to President Obama as a kind of savior in a religious sense. The mainstream press has often given the President passes for all sorts of things that they wouldn’t give President Bush a pass on. Thus the parallels with the Visitors. They come to Earth offering hope, change, and peace for mankind. They offer universal free health care by establishing medical clinics in cities all over the world, curing many diseases. The press fawns over these benevolent and wonderful aliens, who want nothing but good for humanity. For the most part, the people love the Visitors, though a few are protesting. Thus comes the geni us of the Visitor plan. First, infiltrate the population including government, military, and other important positions of power. Next, reveal yourselves to humanity and start offering them free goodies, such as health care and cures for many different diseases. Get the press on your side to control the story and by the time you are ready for the final solution, the population you are about to obliterate won’t even see it coming. I admit this conc ept is not a new one, but considering Earth’s history, it has worked so well in the past for so many. So many of these despots and thug dictators didn’t stage a bloody coup and take over. Most were democratically elected, got their people into position, then simply transformed the country into the image they wanted. Look at Nazi Germany. Hitler rose to power not through the gun (as he initially tried and failed), but by election. Once in power, he established all sorts of things for the good of the people including health care (and believe it or not, I’ve read that Nazi Germany had a very strong anti-smoking sentiment based on stuff Nazi doctors learned well before the rest of the world hooked into the anti-smoking bandwagon). After he and his people had effectively took over, he worked hard and fast to remake Germany into his image but in moving too fast, he ended up destroying Germany. In all honesty, I see a closer parallel between the Visitors and the Nazis, whom let’s not forget were socialists in addition to being nationalist. We’ll see how that aspect bears out, especially if this resistance movement gets any traction and forces the Visitors to take military action. As to the characters, w have some interesting ones. 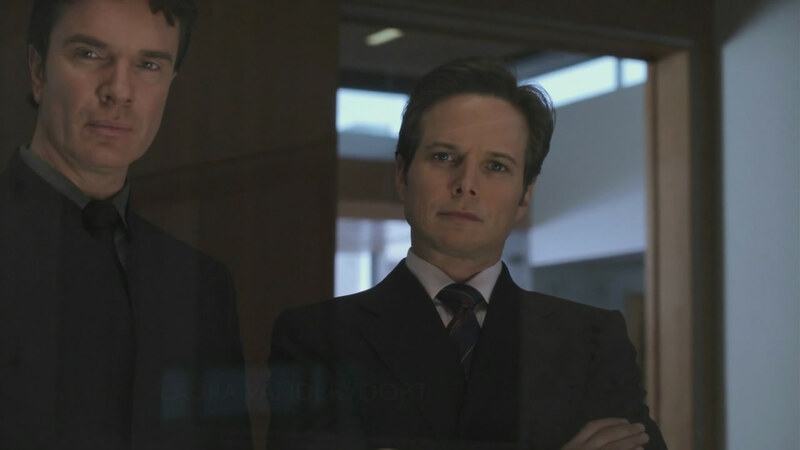 Scott Wolf (Party eof Five) plays the TV reporter Chad Decker, who catches the Visitor’s attention with his fawning attitude toward them. 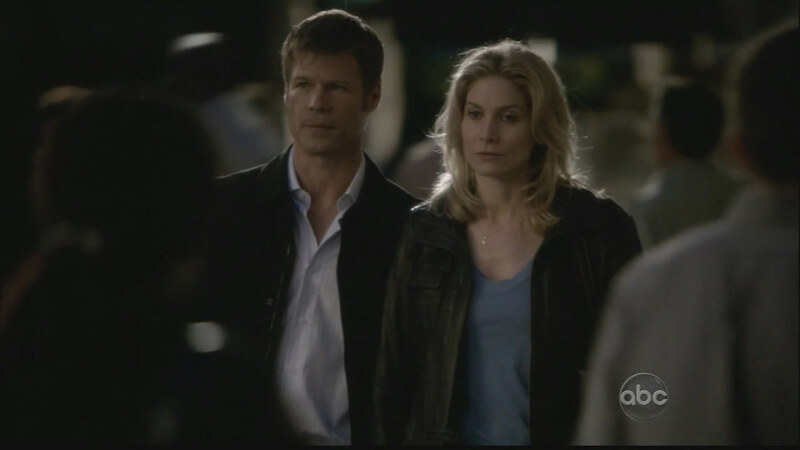 Elizabeth Mitchell (Lost; ER) plays single mother and FBI agent Erica Evans, who struggles to raise her teenaged son, who has very much bought into the Visitor’s propaganda message of hope and change. 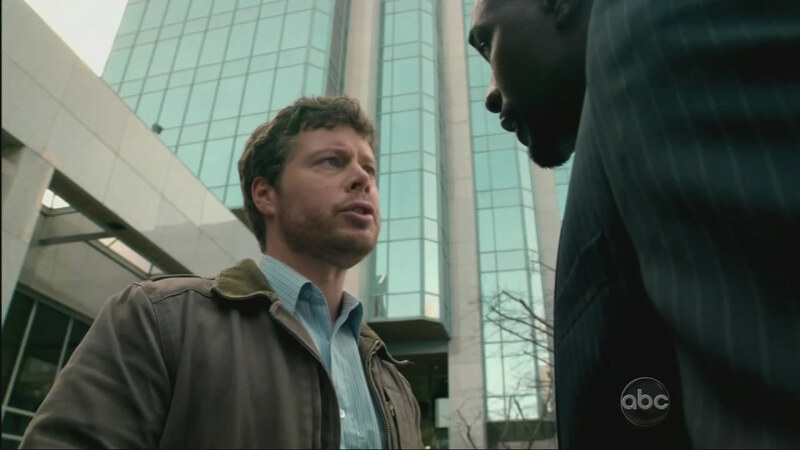 Joel Gretsch (The 4400) plays th e skeptical Father Jack Landry. 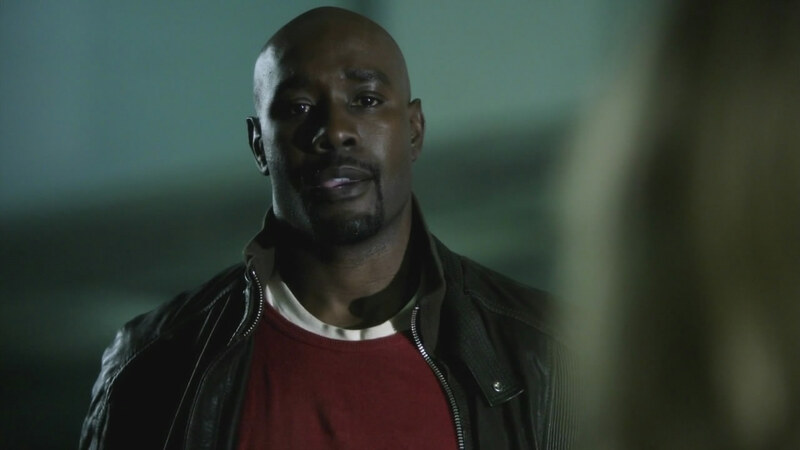 Morris Chestnut (C-16: FBI; Out All Night) plays the traitor alien in disguise named Ryan Nichols. Finally, Morena Baccarin (Firefly; Serenity) was almost unrecognizable to me as the Visitor leader named Anna (I knew the voice but couldn’t place it with her new, short hair style). I can see a lot of character stories being done here on top of advancing the main plot. I just hope the writers can pull it all off. I like how things have been set up and how the main cast has been carefully placed on the board. I’ve written a lot h ere, but in the end, I found the time flew by and I was inspired enough by what I saw on TV to write a lot here. *lol* That’s a good sign that I rather enjoyed the pilot episode. We have an interesting story premise, interesting characters, and good SFX which if done right could be the start of a really good series. I sure hope so. This entry was posted in review and tagged TV, V (2009) on November 5, 2009 by AstroNerdBoy. I remember when Space: Above and Beyond was announced to be a new Fox show for the fall of 1995. It was an exciting but frustrating time to be a sci-fi fan. 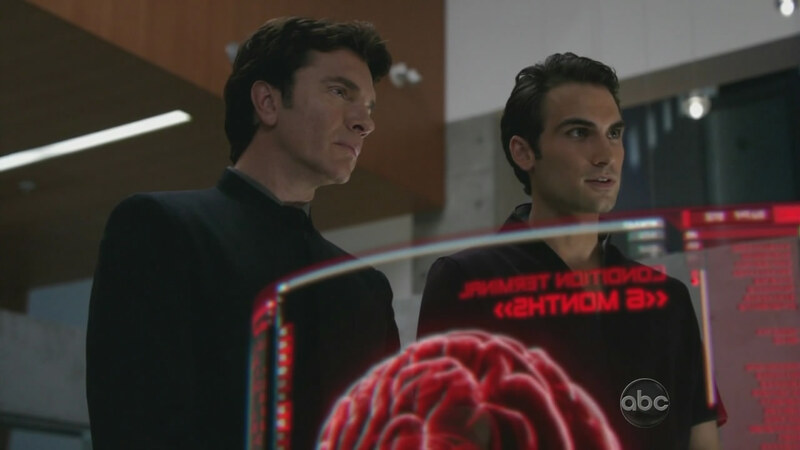 On TV, Earth 2 had been canceled as had Brisco County Jr. The series seaQuest failed to impress me (the second season killed it for me), but Babylon 5 was somehow making it in syndication and Star Trek: Deep Space 9 was going into its third season. Space: Above and Beyond centered around a group of multi-purpose marines belonging to the 58th “Wildcards” Squadron. They have different reasons for joining the marines but when war breaks out with an alien race known as the “Chigs,” they are assigned to the space carrier USS Saratoga. While they are primarily pilots flying SA-43 Endo/Exo-Atmospheric Attack Jet fighters (known as Hammerheads), they also do special ops missions (even on the ground), regular ground force missions, and cargo transport missions. I recently re-watched the series for the first time since it was canceled after a single season. Looking back, I can see some things that I think caused the show to fail. For starters, the pilot is a laughable episode. These “marines” look like what they are — civilian actors pretending to be marines and not doing a very good job. Seriously, give these people real military hair cuts! Half-way through the series, the cast all received hair cuts that would be seen a lot in the Air Force, but not for Marines. The actors never made me think they were marines and that is its first and biggest problem. Next is the mission of the marines in this series. It costs a lot of money to train folks to be pilots. While marine pilots would have many jobs that aren’t in the cockpit (and potentially in combat), the military isn’t going to take a fighter squadron and send them on a Seal mission. While marine aviators are trained to fight on the ground (and in history, pilots with no plane have indeed fought to defend a position), the military wouldn’t just send them to do some military ground operation when there are plenty of other marine ground troops that can handle the situation. Unfortunately, the writers of Space: Above and Beyond apparently couldn’t find enough stories for pilots (even when throwing them into a cargo transport) and so had our group of aviators do jobs that they would not do. So, another strike on the old believability scale. Because the first half of the series has shaky stories and less than stellar performances (no offense to the actors), I think that doomed the series. 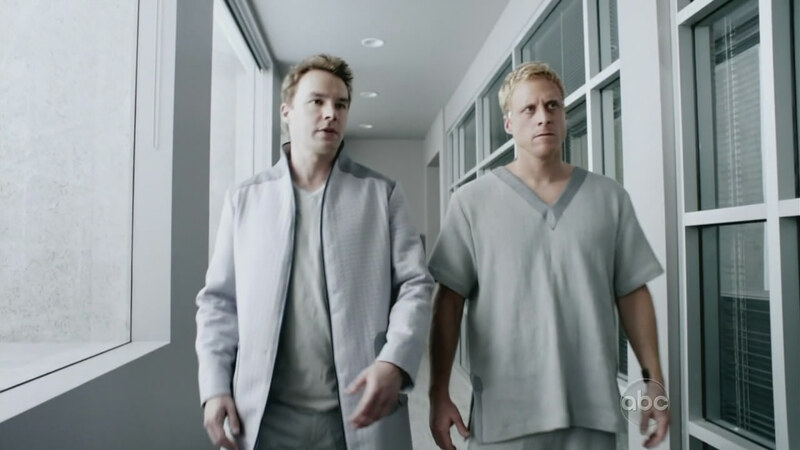 The 2nd half of the series made improvements to the stories and the actors became better with their roles. An attempt to make the cast feel more like a military unit helped and the writers inserted a throw-away scene with the 58th’s commander addressing the believability issue I mention earlier established that the 58th Squadron weren’t just pilots, but were marines and that meant that they could be sent to do ANY marine-related job. Yeah, whatever. There were items of interest though. There were several plots that intertwined, including the overall arc of the Chig War, the thread of whether the corporation knew about the Chigs when they sent out to colony settlements, the previous A.I. War, and the “tanks” where humans that were artificially created and born in labs to fight are discriminated against. Unfortunately, as things had begun to improve story-wise, the series was canceled and the audience is left with quite a few unanswered questions and a war that is still being waged. It is a shame the series didn’t get another season to help prove itself. The first season or two of any long-running series is going to be a bit rough. Today, the show’s CGI work for space shots look very dated. Even back in 1995, the effects looked a bit rough at times (mostly for the carriers), especially when compared to Babylon 5‘s CGI work. Rewatching the series, I’m not sure if I’ll ever want to rewatch it again. So I can see why the show was canceled, but I still would have preferred it to be given more time to prove itself. This entry was posted in review on July 31, 2008 by AstroNerdBoy. SPOILER Summary: The Doctor and Donna travel to a random time and place in the galaxy and end up in the 42nd Century during the 2nd Great and Bountiful Human Empire. They come upon a dying Ood who briefly has the same red eyes of possession the Doctor had previously seen. Bluffing their way into a presentation for potential buyers of Ood, the Doctor and Donna discover that things aren’t going that well for this slave-race, or their human owners. With the Doctor being able to now hear their song of captivity, he decides to try to free the Ood as more and more of them go insane. The Doctor soon learns that the Ood have three brains — one in their skull, one they hold in their hands, and a giant, collective brain. The removal of the held brain is how the humans enslave them and the giant brain is kept in a field to interrupt its telepathic ability. However, in the end, the field around the giant brain is lowered and the Ood are freed, thanks to the Doctor’s efforts. Thoughts: I had some problems with this episode, namely in the ultimate design of the Ood. Think about it for a moment. They have a brain in their skull, then they carry a mini-brain around in their hands, and finally there’s a giant brain. So, assuming the giant brain has some method of protecting itself (which didn’t appear to be the case but for the reasons of discussion, we’ll assume so) and the Ood have to protect their mini-brains by carefully holding them, how do the Ood do ANYTHING without causing their mini-brain serious damage? Seriously, this is one huge design flaw and frankly, the Ood should have gone extinct. OK, so they can easily survive without the mini-brain, where (how convenient), humans figured out that they could cut off that brain and just install a translator on a tube. Isn’t that lovely? Of course, we have to get preached to on the evils of slavery. The episode tried to push over the fact that the Doctor wasn’t that concerned over the Ood slavery issue on the previous encounter because he was too occupied dealing with “Satan,” but I suppose they felt that the Doctor needed to free millions of beings after having to allow 20,000 humans dies in the previous episode. Everything just felt forced, preachy, and I just didn’t care. The one bit of interest was the Ood telling the Doctor that one day, his song must end. I’m not sure what that implies, but it does seem to throw out a possible regeneration (which I’ve not heard about, but I’ve not been reading up either) or something. I don’t think it means the end of the series even though I’ve read that next year, there will be no series but rather a few TV movies, which is rather a bummer. The episode reminded me that I’m getting older. I kept thinking I recognized the actor playing Klineman Halpen but was surprised when I learned it the character was played by Tim McInnerny, whom I’ve seen countless times in the various Blackadder British comedy series. Also, Roger Griffiths (Everton in the British comedy Chef!) 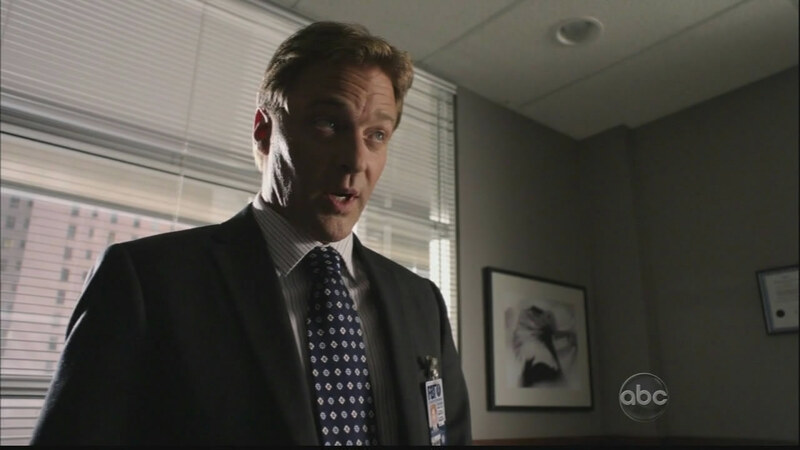 was also in this episode, looking much older as the security head Commander Kess. Next week: the return of Martha and a classic Doctor Who villain — the Sontarans. This entry was posted in review and tagged Doctor Who on April 21, 2008 by AstroNerdBoy. SPOILER Summary: The Doctor and Donna arrive in what he says is ancient Rome, but an earthquake and Mt. Vesuvius tells him this is Pompeii. As the TARDIS has been “sold” to a man named Caecilius. Arriving there to get the TARDIS back, the Doctor and Donna are in time to meet one Dextrus, the town augur, who’s had Caecilius build what looks like a circuit board of marble. They learn that Caecilius’s daughter Evelina (a prophetess set to join the Sibylline Sisterhood) and Dextrus accurately identify the Doctor as being from Gallifrey and a Lord of Time. With Donna wanting to save the people of Pompeii (something the Doctor refuses to do) and not taking no for an answer, the Doctor pays the Sibylline Sisterhood a visit, to discover their chief priestess turned to stone and being possessed by someone from the race known as Pyrovile (a stone people). 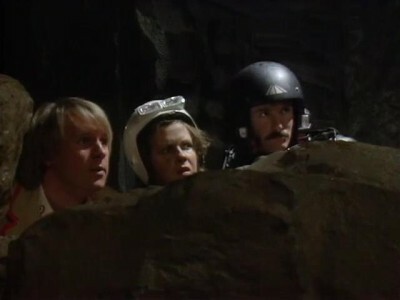 Going underground, the Doctor and Donna discover the stranded Pyrovile, who want to make Earth their new home. Given the choice of 20,000 deaths vs. the entire world, Donna finally understands and they throw the switch to destroy Pompeii (causing Vesuvius to errupt). Donna asks the Doctor to save at least one person, so he saves Caecilius’s family as that won’t change history. Thoughts: This was a pretty good episode, more so than last week’s for sure. I understand Donna wanting to save Pompeii because that is an emotional response. Her argument for the Doctor saving Earth when he met her the first time is a reasonable one. I liked how the writers tied the destruction of Pompeii back to the loss of Gallifrey and how the Doctor cannot (apparently) change that outcome either. Donna, while still being a mule head at times, is still much better than she was in the Christmas special with her deciding to help the Doctor throw the switch to destroy Pompeii. I liked that as well. The joke about the TARDIS translator and Donna trying to speak Latin to the Romans at Pompeii was amusing. However, I figure that IF Donna actually knew Latin, the translator wouldn’t be required, would it? She should be able to speak and the other people understand her. So while the joke is amusing, it doesn’t make a lot of sense to me in a “realistic” sense (given that this is a work of fiction). The whole “Doctor is a deity” thing came up again. It is not an aspect I’m that keen on, but it is interesting to say the least. This entry was posted in review and tagged Doctor Who on April 13, 2008 by AstroNerdBoy. SPOILER Summary: The Doctor is investigating a new anti-fat pill from Adipose Industries while former companion Donna Noble does the same, hoping to once again meet the Doctor and this time join him on his journeys. While this new pill does indeed reduce fat, it does so by causing the fat to form into a blockish body, the infants of a race known as the Adipose. When company head (and nanny) Miss Foster discovers the Doctor is onto her, she accellerates plans so that instead of just fat, those who’ve taken the pill will now have their entire bodies coverted into Adipose, forcing the Doctor and Donna to try to end the process lest many people die. Thoughts: This is an OK episode. When I heard that Donna was returning, I was not thrilled. Catherine Tate annoyed me to no end in “The Runaway Bride” with how Donna was played. Ugh. However, her acting is toned back a bit for this episode, and she becomes a more likable person, though with those traits seen originally still there. At least now they aren’t in ones face all the time. There was a bit of comedy with the Doctor and Donna miming a conversation to each other. The biggest “win” moment for me (SPOILER y’all) is when Rose was in the crowd after the events observing, then after Donna speaks to her (not knowing who she is of course), Rose walks away and disappears. That’s some intriguing bit of table setting for sure. Otherwise, this episode is just too kiddie for my tastes. It is one I can see fast-forwarding through when the series comes out on DVD. This entry was posted in review and tagged Doctor Who on April 11, 2008 by AstroNerdBoy.